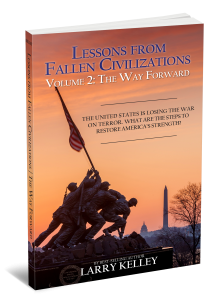 “In Lessons From Fallen Civilizations Larry Kelley reminds us how important history is in informing and instructing the future. As the book suggests, history is written by the winners. To this point, though it has lost battles, Western Civilization has been winning the war. That may change. As Kelley documents, loss will be catastrophic. “Western CIV 101 before the imams of political correctness took over our campuses. “I love Larry Kelley and have followed his writings for over 4 years now. When he tells a story you can count on it being the raw unadulterated truth, good , bad or indifferent. I count on Larry Kelley to give me the facts and tell me the history of issues and he never disappoints. This book was an amazing read and all the history was relived in the book. It really an interesting to read how much history has repeated itself with people who didn’t get the message the first time around. 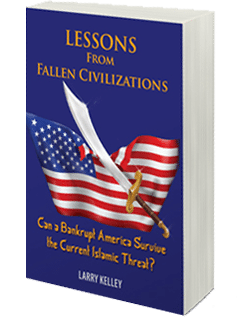 If it weren’t for the breadth and the sweep of the accumulated history lessons here, I might have been inclined to become somewhat discouraged for America by reading Larry Kelley’s new book, Lessons from Fallen Civilizations. In point of fact, however, this is an invigorating and inspiring read, identifying and linking, as it does, those characteristics which weakened and even brought down ancient empires to the many and several comparable traits America is hesitant to combat today. Thankfully, the author departs from the many “we’re all doomed” pot-shotters who sit in the corner and feel sorry for themselves; rather, the book’s hopeful tone serves as a call to action both to those who have failed to diagnose adequately the depth of our problems and also to those who are too feckless and enervated to stand up and fight for what they know is right. Highly recommended to the current observer and also to those who, like me, needed a refresher course on the frailty of fortune and the vulnerability of those too casually regarded as giants. Rating: 5 out of 5 stars – A Knock-out! If you’re a liberal, he aims to make a bleeding liberal out of you, but not in some pleasant touch-feely kind of way. The writing is both engaging and bruising. The history lessons are sweeping, panoramic and seem at times to float like a butterfly, whereas the merciless jabs at the current administration — you guessed it — not only sting like a bee but are delivered with the hope the recipients are deathly allergic and totally reliant for their emergency room treatment on government-sponsored healthcare that, if all goes well, is nonexistent. Sure, we know politics is blood sport. In true libertarian spirit, Lessons From Fallen Civilizations is written in the mode of extreme sport — gloves off, no rules — but not for any love of anarchy. Just the opposite. The fight is for a genuine love of something noble and great — not prize money or a gleaming belt, but love of our country and, yes, our civilization as we know it, vulnerable to slipping through our fingers like the sands of time we can no longer afford to waste. Don’t just stand there. Get in the ring! Why? Read this book! Lessons from Fallen Civilizations should be required reading for all candidates and all voters in the 2012 election. It was given to me by author Larry Kelley via NetGalley, a distributor of galleys to professional readers, including reviewers. I have been reading since I was four and I am almost 69, with a Ph.D. and a history of reading one to six books a day for 64years. But never before have I read such a cogent argument. In the course of ten years of research before writing the book, Kelley identified ten immutable laws which tell when a civilization is in danger of collapse. Then he studies the history of the struggle between the East and the West from the Battle of Marathon to the present, showing how those laws apply to each civilization. Don’t worry if you don’t know ancient history; his explanations are adequate. He applies these laws to the present day and explains what can be done to back our nation out of its present predicament, to last longer than would otherwise be the case. I have his permission to quote all ten of those laws. No nation has ever survived once its citizenry ceased to believe its culture worth saving. In battle, free men almost always defeat slaves. Appeasement of a ruthless outside power always invites aggression. Treaties made with ruthless despots are always fruitless and dangerous. If a people cannot avoid continuous internal warfare, they will have a new order imposed from without. When a free people, through taxation, is deprived of its ability to acquire wealth and property, collapse is presaged. To hold territory, a state must be populated by those loyal to the central authority. When immigration overwhelms assimilation, the fall is predicted. With the loss of fiscal solvency comes a loss of sovereignty. When a civilization accepts the propaganda of its enemy as truth, it has reached the far side of appeasement and capitulation is nigh. These sound like broad, sweeping generalities. But Kelley provides solid evidence, thoroughly documented. I ask the reader: How many of these laws apply to the United States today? Be honest in your assessment. Then go and buy the book, read it, and ask everyone you know to do the same. Then the United States will survive a few more generations. Ignore this book at your peril, and at the peril of all your descendants. In the 1990’s Francis Fukuyama declared we had attained the end of history in a world of universal human rights and democracy while Samuel P. Huntington theorized that the clash of civilizations is the unavoidable nature of conflict in the post cold war world. While not signing on to Fukuyama’s rose-tinted worldview, Larry Kelley does not succumb to fatalism. His goal is the avoidance of a clash of civilizations and his solution is exceptional. Today he identifies the United States as dangerously weakened by overwhelming debt, high unemployment, slow growth… and the situation of our European allies is even worse. Unable to rely on a Europe too burdened with their Euro crisis, social tensions, and resentments, the author reaches out to women whose suffering he details, suggesting all they have to gain. Insisting that Navy Seals’ raids, Predator strikes, and even military invasions will not save western civilization, he urges us to stand with the women of Islam, to whom he dedicates his book. In Lessons from Fallen Civilizations, author Larry Kelley holds up a startling mirror to the face of America, showing the true and fragile state of our once great nation. Filled with rich historical fiction as well as analysis, this talk is as engaging as if the reader is witnessing events first hand. This work has opened my eyes to a very present threat to our survival as we become increasingly too weak to defend our land, our allies, and our interests. Witness the recent attacks on our embassies; Kelley makes clear that the American empire is in danger. I would make Lessons from Fallen Civilizations required reading for all college students and recommend it to anyone with an ear for history and a cautious eye on the future. Rating: 5 out of 5 stars – I Wept after reading the sample! I’ve only read the sample on my Kindle, but after being reminded of the men who are honored and praised as great politicians and statesmen by the socialist faction in our country, I felt very sad. Our country has been betrayed by the very men and women who took an oath to uphold the Constitution! They’ve trampled on it, and dishonored it long enough! I grew up loving America. Proudly pledging allegiance to the flag, in school! Our government has been hijacked by a few self-serving professional politicians, who care only about their careers. Is there one politician in our government willing to put his or her professional life on the line to really serve this great nation? I pray to God that there is! It’s time for another Tea Party! A revival of patriotism like we saw immediately after 9/11! I only hope there’s time enough to turn things around. But, it’s only going to happen when people read books like this, and then decide what role they’re going to play in that revival! We’ve managed to kick God, prayer, and the teaching of moral values out of our schools. Why are we then surprised that our current administration is the laughing stock of the entire world? Read this book! Then decide, what can I do as one person. And then do it! I am! 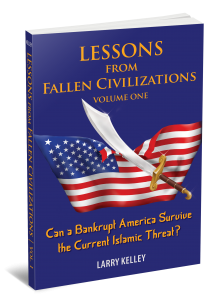 Lessons from Fallen Civilizations offers a completely original and intelligent look at the threats posed to Western Civilization, threats that many in academia and in the press seem to overlook. Not only does Kelley shine the light on Islamic extremist intent and shows how it emanates from centuries past, but he also demonstrates how those intentions are now manifest in a modern setting. He profiles the downfall of five great civilizations, Greece, Carthage, Rome, Byzantium and ending with the fall of the Ottoman Empire in 1918. I saw a great deal of overlap in learning how each of these great civilizations made bad decisions that ultimately led to their destruction. In reading Kelley’s book, it made me want to set out to change the trends and patterns in current Western Civilization that could lead to our destruction. The plethora of information provided by Larry Kelley both illuminates and proves his thesis–that being, great civilizations fail for specific reasons. Kelley makes his reader understand why it is that we must learn from history. And shows through the fall of five great civilizations that history does definitively repeat itself. Moreover, Kelley’s conclusions provide perfect antidotes to thwart the current atrophy of the United States of America. This book should be required reading for every American Citizen. It gives an excellent pictures of conflicts between Islamic and all other cultures of the world. I caught just the tail end of Mr. Kelley’s interview on the Coast to Coast radio show, and became intrigued with the question of the Ten Immutable Laws Governing the Fall of Civilizations. Since I missed the crux of the interview, I decided to buy the book, and am extremely glad that I did. This was an awesome read! Foremost in my opinion, it gives the best world history lesson I have ever had! Part One, titled “Ancient Threats to Western Civilization,” was a succinct, yet thorough review of the Greeks, Romans, Carthaginians, etc. It discussed Hannibal, Atila, the Scipios, and the rise and fall of the Romans. I feel like I know something now! Very well written. He very lightly weaves current U.S. policies into this chapter, and leaves you going “uh-huh, uh-huh.” Part One was five-star material. Part Three of the book was the most disappointing. While it had a bold title: “Resurgent Militant Islam,” it drifts off into the realm of political opinion. Don’t get me wrong; I agree with most if not all of his opinions. It’s just that given the brilliance of the first two parts of the book, I wonder how he justifies: “Gone are the days when a conservative president will politely absorb endless ad hominem attacks upon his character from the Left.” [Truncated slightly] In much of this section, it appears that the author, frankly, is engaged in wishful thinking. But even this part of the book makes some good observations in continuation of the original theme. Of course, it continues to weave the Ten Immutable Laws into the text, if they are not already obvious by this point. So this is a definite “recommend.” I now have some interest in some of the historical subjects that Mr. Kelley introduced me to. Excellent digest of earlier fallen civilizations and their parallel to our current one. An eye opener to our country’s future. Discover the ten factors that have repeatedly brought down great civilizations and which threaten us now!